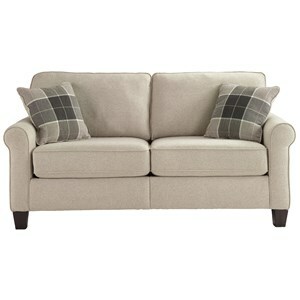 Add a classic design to your home with this upholstered love seat. 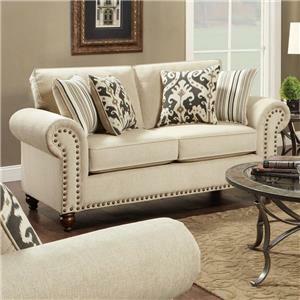 Traditional in style, this loveseat features large rolled arms, tapered block legs and exquisite nailhead trim on the arm panels, front band and top rail. Available in multiple fabrics by special order, pair with a matching chair, ottoman or sofa for a complete living room set. The 2840 Upholstered Loveseat with Tapered Legs by Mayo at Olinde's Furniture in the Baton Rouge and Lafayette, Louisiana area. Product availability may vary. Contact us for the most current availability on this product. Leg or Skirt Exposed wood tapered legs are available in a variety of wood finishes. Create an elegant and sophisticated home with the 2840 collection of upholstery. 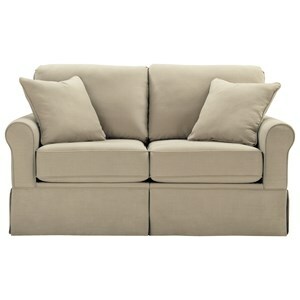 This collection offers a sofa, loveseat, chair and ottoman for a complete room setting. 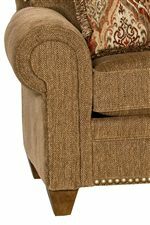 Gorgeous nail trim (optional), rolled arms and tapered legs add traditional style. Customize pieces to suit your style and decor with optional contrasting covers or fringe on the pillows and a variety of wood finishes and multiple fabrics to choose from. The 2840 collection is a great option if you are looking for Traditional furniture in the Baton Rouge and Lafayette, Louisiana area. Browse other items in the 2840 collection from Olinde's Furniture in the Baton Rouge and Lafayette, Louisiana area.